Heart failure is a condition in which the heart struggles to pump blood effectively to keep up with the body’s demand for oxygen. Although, it was perceived to be a very serious condition in the past, heart failure is not as terrifying as it sounds. It also does not mean that the heart has failed or stopped working, but only that it is not able to function as efficiently as it should. Fortunately, heart failure can be managed and most definitely reversed through medication and certain lifestyle changes such as following a nutrient-rich diet and to some extent through exercise as well. 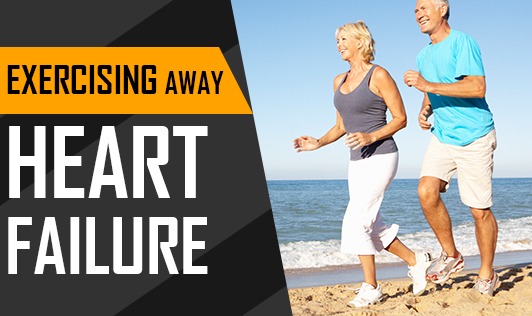 Exercise is one the safest ways to reverse the symptoms of heart failure. This is because heart failure weakens more than just the heart. In heart failure, skeletal muscles deteriorate owing to cellular-level damage and this condition can make it very difficult for patients to perform any sort of activity. But, as hard as it may seem to perform any activity in this condition, exercise is still considered one of the most effective ways to build and regain strength of the skeletal muscles. Exercise activates progenitor cells, a group of immature cells present in the skeletal muscles. These muscles divide into mature cells required for muscle repair. People with heart failure generally have only half as much as progenitor cells as compared to healthy individuals. A recent 6-month study conducted on patients with heart failure concluded that, exercise indeed helps with the division of progenitor cells, formation of new cells, and active muscle repair. Another study also found that the activation and production of progenitor cells gave way to the formation of new vessels in the skeletal muscle region. Warm-up exercises like stretching, Tai Chi, and Yoga for better balance, range of motion, and joint flexibility. Cardiovascular exercises like walking, jogging, stationary cycling, and low-impact aerobics for improving heart and lung function and increasing the body’s ability to use oxygen. Strength training using weights or resistance for strengthening skeletal muscles. As mentioned before, exercise may not be the only way to reverse heart failure, but it definitely is one of the most cost-effective methods to regain strength and vitality and reduce symptoms of heart failure, provided, the rehabilitation program is practiced on a regular basis and is tailor-made to suit the needs of the individual.